Club Acoustica evolved to provide original artists with a space to perform their music in an acoustic format. The Club style allows both the performer and the audience to actively and intimately enjoy the performances given. The atmosphere evoked is relaxed, candlelit and focused on the musician's sonic creativity. All styles are valid and a level of individual excellence can be assumed. The venue has moved around a bit, though East Village in East Sydney is now the weekly Sydney home base, with other venues operating on a monthly basis around Australia. Club Acoustica strives for an atmosphere like that found in those little clubs in New York's Greenwich Village or Berlin that you've heard of, where 'so and so' played for the first time and then went on to fame and fortune - you'll never leave a night without hearing at least one artist that turns your ears on. Acoustic performance can be daunting to even the most seasoned performer... you can't hide behind snazzy sound enhancers or a Marshall stack. It's a much rawer and in-your-face performance style. And Club Acoustica has launched some brilliant new talent and also allowed other artists to go back to basics, try out new songs and reconnect with their audiences. Club Acoustica provides an intimacy with tables and candlelight, yet the vibe is big, the array of talent vast, and you still walk away feeling that you've experienced the essence of the art of music. We provide the engineer and venue, and we advertise, promote and actively encourage new talent. We have a number of wonderful sponsors who share the Club Acoustica vision, and encourage the birth of new talent, and now we are online reaching out across the world. Since its inception in August 1998 over 1,000 artists have performed to enthusiastic audiences around Australia. Visit our online store and listen to sound bites from the Club Acoustica Showcase CD, recorded live at Sydney's premiere venue The Basement. Information on all of the Club Acoustica venues is available online in the Gig Guide and our Artists Pages include profiles and links to all the Club Acoustica performers both past and present. So now we can be found, searched and explored by like-minded souls on the endless quest for new, hot and perhaps undiscovered talent. Our world will be your oyster and we promise a bounty of 'pearler' performances. So please take a tour of our modest site - you'll find an up-to-date Gig Guide to fill up those blank nights in your diary. Visit our Gallery and see pictures of the artists in action... join the Mailing List if you're interested in first hand performance news. "all original, no amps or electric guitars, stripped back drums", thus allowing song writing and musicianship to shine forth in an intimate performance space. Positioning itself at the forefront of the acoustic music renaissance, Club Acoustica aims to provide a stepping stone for emerging artists to hone their performance skills in front of appreciative crowds and, since 2002 on the AcousticA radio show each Wednesday 6.30 - 8.00pm on 2SER 107.3FM, playlist and interview many of these acts. In March 2003 "Club Acoustica: Live At The Basement Vol 1" was released to widespread critical acclaim and plans are afoot for Volumes 2 and 3 to be released in 2004. 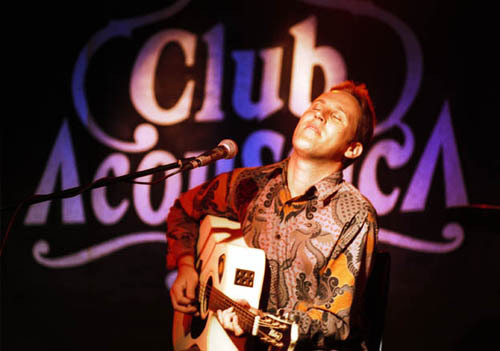 In December 2003 Club Acoustica Melbourne launched their monthly Tuesday showcases at the stunning Manchester Lane, which has been gaining profile and attracting some stunning artists. Club Acoustica have also presented two incredible annual One World Beat shows in March 2003-04 at the Basement, a 9 act showcase at the world famous 2003 East Coast Blues & Roots Festival in Byron Bay, Sydney Fringe Festival showcases in 2001-02 as well as a number of showcases in Brisbane (Elephant & Wheelbarrow), Adelaide (The Gov), Parramatta and Balmain. We have been widely documented in publications such as Drum Media, The Bulletin, APRAP, Fresh Magazine, The Sunday Telegraph, The Sun Herald, SMH Metro, The Brag, Revolver, SLM Magazine (Daily Telegraph) and The Melbourne Age, with the articles and reviews all archived in the Reviews and News sections of our website. In May 2004 an 11 minute radio documentary on Club Acoustica was commissioned by AMRAP which has been distributed nationally to over 300 radio stations. Most importantly we have now welcomed in excess of 20,000 people to our many shows, introducing them to new and innovative original Australian music, as well as helping build a network of like-minded musicians and performance opportunities nationally. Our website currently receives over 15,000 hits a month and we e-mail more than 3,000 members weekly details about our shows. We look forward to seeing you at a show, whether welcoming you back or for the first time, and trust you will enjoy the atmosphere, diversity and talent on offer.